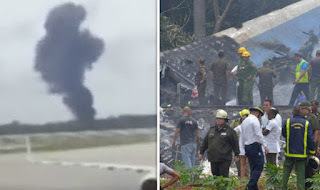 The accident in which a Boeing 737 operated by the Cubana de Aviación company crashed shortly after taking off in Havana, leaving at least 100 people died and three survivors, has brought the issue of this type of plane being safe. Experts consulted by BBC Mundo gave their opinion on the matter. The Boeing 737 is the most popular model in the history of aviation: last March, the 10,000th unit was sold. Far ahead of its main competitor, the family of the Airbus A320, which has billed to date about 8,000 aircraft of this type. "If you look, you'll find them in many accidents, but there are 10,000 of that kind of aircraft!" Graham Braithwaite, professor of accident safety and investigation at Cranfield University in England, told BBC Mundo. "It's like iPhones, there's always news that they have presented problems but it's not because they are worse, but because many people have them," he said. The Boeing 737 began to sail the skies in 1968 and since then it has gone through several modifications that are grouped in generations. The damaged aircraft was leased by Cubana de Aviación to the Mexican company Dahmoj. It was a Boeing 700-200, which means that it belongs to the first generation. It began commercial flights in 1979, according to the International Civil Aviation Organization (ICAO). It was therefore one of the oldest commercial flight planes still in operation, according to The New York Times. "That it is old does not mean that it is insecure, what matters is the maintenance that has been given to it," Javier Martín-Chico, director of the technical department of the Spanish Union of Air Line Pilots (Sepla), told BBC Mundo. Both experts explained that an airplane like the one that crashed in Cuba must go through several periodic inspections and that some involve completely disassembling it to make sure that each element is in good condition. "Many airlines take their Boeing 737-200s out of the market because it's more expensive, it consumes more fuel, and some airports do not let them land because they make a lot of noise, but not because of safety issues," Braithwaite said. "When a plane is old, you do not have to remove it from circulation but to prove that it is able to fly." Dahmoj's aircraft had passed its last inspection between November 21 and 24, 2017, according to the government of Mexico, which stated in a statement that the company applied "maintenance services in accordance with the manufacturer's maintenance program and the program of maintenance approved by the General Directorate of Civil Aeronautics". The Boeing 737-200 was the last one to have a fully analog cockpit. The version that followed, the Boeing 737-300, was the first to include a screen, "a brutal difference," Martín-Chico explained. Braithwaite admits that this requires the pilot to be more alert, because unlike the current models, it does not have a computer system that warns more quickly and efficiently of the failures that may be suffering the aircraft. "In an old plane you have to process more information, a more modern one tells you what's wrong and how to respond," said the professor. "But it has its positive side: if you pilot a Boeing 737-200 it means you're a very good pilot." And the expert seems right. The first witnesses of the fatal event have confirmed that thanks to the maneuver of the pilot many lives were saved, as it seems he avoided collusion with populated places.